Earlier this year, I attended the QAA Annual Conference in Nottingham to talk about a project on training for postgraduates who teach that I’d been working on. One of the keynote speakers at the event, aimed at higher education policy-makers, senior management, and administrators, was Professor Eunice Simmons, Deputy Vice-Chancellor at Nottingham Trent University. Eunice was talking about student engagement, and showed us a photograph of students in a workshop using two-handed bladed tools to carve wood. All the students photographed were bent over their task, intensely focused, and absorbed in their activity. Eunice, for comic effect, suggested that this might be because the students were working with very sharp knives, but she wondered how this concentration and focus might be replicated in the classroom. Easy, I thought – give students knives! Of course, I don’t mean literally, but bear with me while I expand this metaphor. What is a knife? Something dangerous, for sure. A tool that can be used to make something. A weapon. Something that must be handled carefully but, with skilful use, can be used to create something remarkable and individual. This definition could equally be applied to knowledge – when learning is most effective it too, should be handled with care, but can produce something extraordinary. What I’m getting at (which might not be what Eunice Simmons had in mind so apologies to her for going off at a tangent) is that because these students were given a dangerous item that they had to consider carefully, they paid more attention and were more engaged in the task at hand. Danger (in the form of knowledge or knives) is not something students encounter very often in their learning. But we live in an increasingly dangerous world; climate change, white supremacy, intolerance, terrorism – these are all things our students are dealing with in their lives outside of university. As educators, we have a responsibility to equip our students to deal with this, by talking about the dangerous world outside in our classes – bringing danger inside – and by giving our students the right tools to understand and challenge these dangers. In other words, we need to give our students knives, but teach them the skills they need to understand how to use them. ‘Dangerous learning’ has generally not been seen as a positive thing. Berthoin Antal and Friedman (2004) argue that ‘learning from experience can be dangerous when it inhibits inquiry and closes off new knowledge’ (n.p.) – in other words, particular ways of approaching learning or doing learning can make it dangerously misleading, partial, or insufficient. The implication is that if learning is not done ‘right’, it can lead to unhelpful and dangerous ways of approaching the world that will be potentially harmful to others. I think the point here is that what is considered ‘dangerous’ is non-learning – where students think they are learning, but have not given enough time to reflection of abstract and critical thought. Limited learning is dangerous learning. Particular ways of learning, then, have the potential to be dangerous in unwelcome ways, and these need to be managed. Huish notes that critics of the course “deemed activism a knowledge inappropriate for campus, either because it was morally hazardous to produce knowledge of engagement, or because this knowledge was illegitimate, or because any layperson could acquire the skills on their own” (375). Huish’s words reminded me of Eunice Simmon’s original point about giving students knives – was this inappropriate knowledge for campus learning? Was it morally hazardous? Illegitimate? Not of an appropriate scholarly standard? All of these could reasonably be applied to the carving workshop she observed at Nottingham Trent – another example of dangerous knowledge, but where students were engaged. So dangerous learning happens in relation to the content of our courses (what we teach) and the pedagogic approach (how we teach). 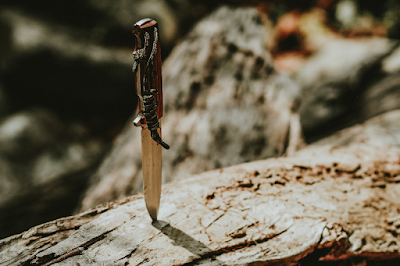 Ultimately, as educators, it’s up to us to bring knives into the classroom – not just because our students might be more engaged, but because by doing so, we might just help to save the world. This is a mix of articles, resources, and blogs. It’s not exhaustive, it’s definitely not definitive, and it has a distinctly medievalist leaning (for obvious reasons). But if you want to give your students knives this year, pick your favourite one and get a-cutting (not literally).